PCBoard Soldering can be a kind of art form, when done properly. 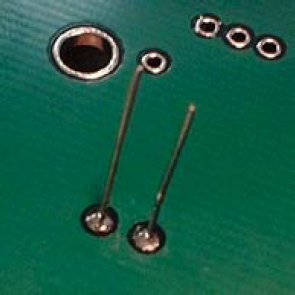 The result should be a perfect physical and electrical connection, between the part lead and the solder pad on the board. I recommend that you find some solder with low lead content, and rosin core. This can help reduce the amount of lead being dumped into our landfills. You should also have a good soldering iron. Be sure the tip size is appropriate for the job. I suggest a 1/8” 3mm screwdriver tip.